Alex Custom Homes has just completed your outdoor living space that fits your outdoor lifestyle and complements your home's design. Now you are ready to change your basement into a great room perfect for enjoying both your family and friends. 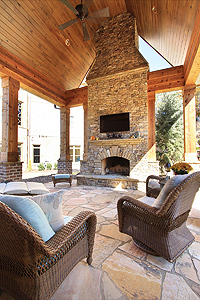 Alex Custom Homes is your remodeler of choice. Please visit our website, alexcustomhomes.com, to see examples of our remodeling projects. You love to entertain. You are ready to build a gracious home that will accommodate that love. AlexCustom Homes has a luxury European house plan, Le Chateau. The kitchen has a large island and ample counter space. The large Grand Room flows into either the kitchen or the over sized screened porch. The Master suite is on the first floor. The second floor has three large bedrooms each with their own bathroom for overnight guests. Our website, alexcustomhomes.com, will tell you more about Le Chateau and our other models.